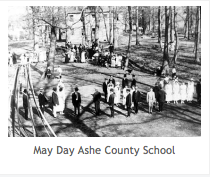 Prior to the 18th century, Ashe County History is somewhat obscured. The Cherokee, Creek and Shawnee Indians hunted, fished and battled within the region. Peter Jefferson led a surveying party in 1749 to establish a line between North Carolina and Virginia, as early settlers and visitors alike were unsure as to whether they were in one or another. In 1752, Bishop Augustus Spangenberg, head of the Moravian Church of America, made the first recorded visit, in search of 100,000 acres of land for settlement purposes. References to hunting expeditions date back to the 1770’s, David Helton being one of the earliest, and Daniel Boone certainly being the most recognizable. Ashe County’s first recorded deed is dated 1773. Encompassing approximately 427 square miles, Ashe’s boundaries have been a topic of continuing dispute throughout the years. The area was part of Anson County during the early English colonization period; became part of Rowan County in 1753, Surry County in 1771, Wilkes County in 1777 and was briefly part of the State of Franklin from 1784-89. Incorporated as a separate entity by the North Carolina General Assembly in 1799, Ashe County came into its own. There have, however been several small additional adjustments to our borders over time. Seeking a “proper and convenient” place to be the County’s seat, the North Carolina General Assembly appointed a special commission in 1799. In the first of many displays of exorbitant spending, the commissioners purchased 50 acres of land for $100. With this expenditure, the Town of Jefferson (for a short time called Jeffersonton) was born, being the first town in the nation to bear the name of Thomas Jefferson, who happened to be the Vice President of the United States at the time. Other incorporated towns within Ashe County include Lansing and West Jefferson, undoubtedly the County’s retail and service hub, offering a wonderful traditional-style walkable downtown. Hunting, trapping and farming were of early significance to Ashe County citizens. Traditional crops included wheat, rye, oats, barley, buckwheat, fruits and vegetables. Cattle operations have also been historically important to the local economy. The early 1900s saw much activity in the dairy industry, with cheese making factories in Grassy Creek and Beaver Creek, Sturgills, Crumpler and Ashland. Eventually, the Kraft-Phoenix Creamery established a plant in West Jefferson in the 1930s. Having had several owners, the plant is now the Ashe County Cheese Plant, for many years, the only such facility in North Carolina. In addition to the harvesting of crops, mining operations have flourished locally, including those seeking iron and copper ores. Copper mining started in the late 1800s, with Ore Knob being possibly the best known mine (at one time, being the leading copper producing mine in the United States). During these times, most farm implements used locally were forged in Ashe County. Helton was the iron-making center of the County, producing plows, hoes, wagon wheels, axes, mattocks and shovels. Another early industry to establish and thrive in Ashe County has been the Phoenix Chair Manufacturing Company, started around 1935 as a byproduct of chairs being produced in a small saw milling operation. Some of the Phoenix Company’s contemporaries include the Knox Knitting Company of Creston, an Oak Flooring Company established by W. E. Vannoy in 1935 and the Peerless Hosiery Company, beginning in 1953. Currently, larger companies located in Ashe County include American Emergency Vehicles, James R. Vannoy & Son Construction, GE Aviation, United Chemi-Con, Inc., Leviton Manufacturing, Inc., and McFarland & Company, Inc.
Ashe County’s early education system consisted of private schools, being held either in the summer or winter. A County Examiner was responsible for certifying teachers, who were primarily women or young girls during summer, and men or young boys during winter. Classes were often held in churches, homes or vacant stores, and teachers would stay alternately with different families within the community. Public schools began in the county in 1870, with school consolidation beginning in 1930. Separate schools for black and white children operated until 1965, when the system was integrated by the County. Currently, the County operates one high school, one middle school and four separate elementary schools. Ashe County is a traditional, mountain community, which holds strong to the traditions and values that have been developed over time, and wrought through experience and struggle. It would take a lifetime to explore and properly appreciate every facet of this large county with a small town feel. Rest assured that the good people of Ashe County are willing to meet the future with anticipation. Most any citizen will greet newcomers and old friends alike with an open home and heart, and will work diligently together, to preserve the lifestyle that makes Ashe County so wonderful. For additional historical notes and documentation, contact the Ashe County Chamber of Commerce.